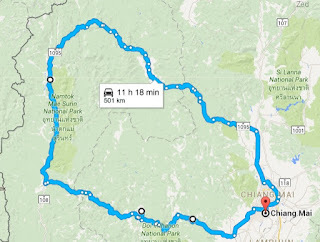 Zed CM : *MOTO TRIP* - Mae Hong Son Loop (through route 1263) Chiang Mai > Mae Hong Son > Mae Chaem> Mae Wang> Chiang Mai. 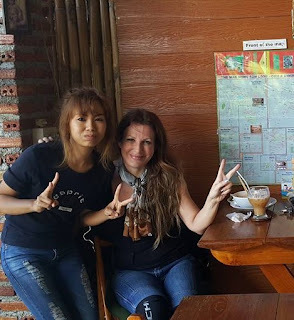 *MOTO TRIP* - Mae Hong Son Loop (through route 1263) Chiang Mai > Mae Hong Son > Mae Chaem> Mae Wang> Chiang Mai. Setting off early to make good time, I headed for the 1095 to Pai. 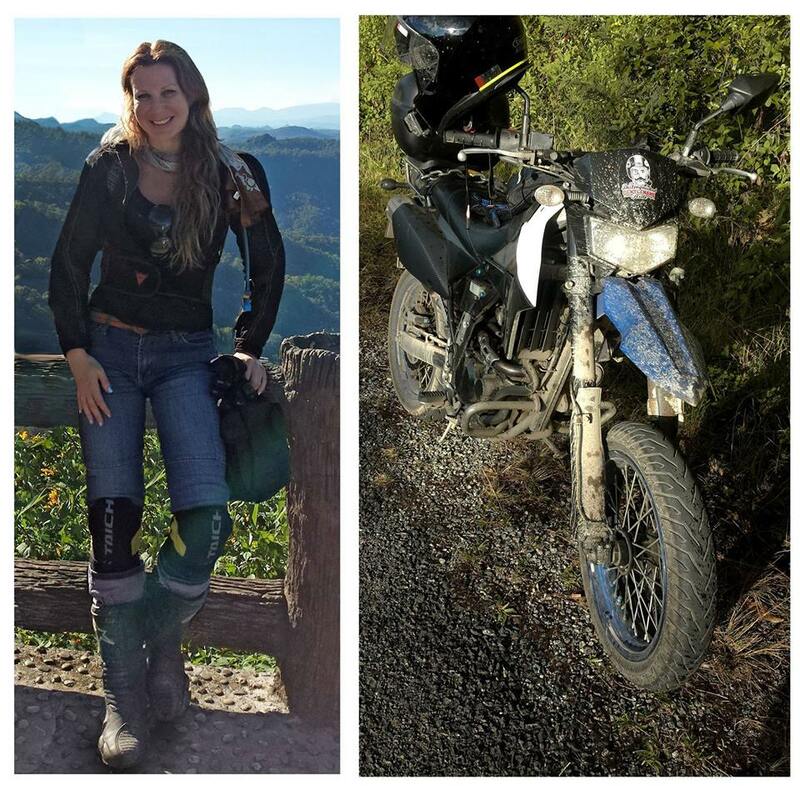 The 1095 is a well-loved moto route, both for scooters and bigger bikes. If you love your twisties, this road is for you! Just before MHS you reach a town called Soppong. I had been told that Soppong River Inn was a lovely place to stay. So I headed there. I arranged to stay in a bungalow on the river, which had a nice peaceful feel to it. Until, that is, a large group of riders checked into the bungalow next to me. The noise was really quite bad and a lot of people were getting drunk and rowdy. It required being brought up about to the owner. Thankfully she was understanding and offered another room. However, what happened instead (which was really very nice of them) was that the group of riders who were told about the noise disturbance, decided to move to a different bungalow instead. I did feel a little guilty but at the same time I got a much needed quiet time and a good nights sleep. The bungalows at River Inn are close to each other so noise reverberates, sadly. It was a very scenic place though and would stay again. 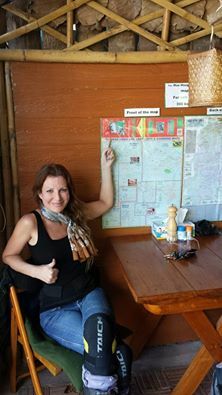 They also had a GT.Rider map up on the wall. Nice one! Cant recommend this map enough! Get yourself one if you plan on exploring the Northern regions and Laos. I ended up taking far longer in the restaurant than I should of and realised I wasn't making good time if i wanted to get to Mae Chaem. There were dark clouds looming also, and it seemed a spot of rain was heading my way. I absolutely didn't want to stay in Khun Yuam, that's for sure, as too many bad memories from years before (I'm referring to my accident, which is what this trip was actually all about..). So I headed off for the 1263, only stopping in Khun Yuam to fill up. As I mentioned previously, this trip was a cathartic one for me, because it was all about retracing my steps when I had a serious accident 4 years previously on the same day. I recall nothing of the route due to the concussion I sustained and I wondered if riding along the same route would bring back any memories. But nothing was coming back to me. About half an hour into the ride a small thunderstorm hit and it was really refreshing. 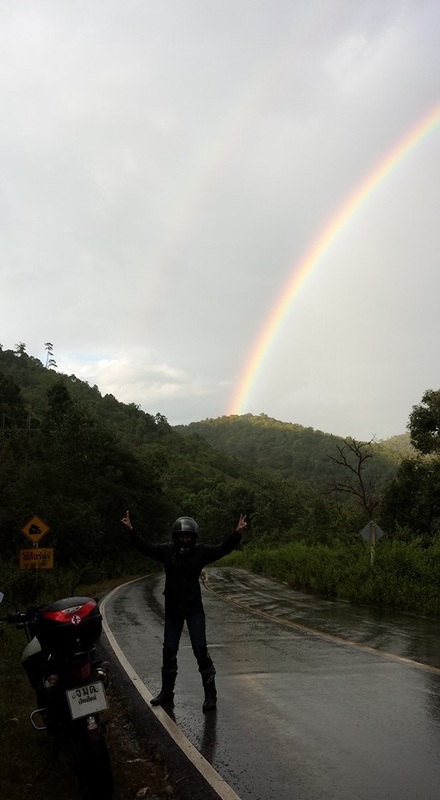 It didn't last long and at the end I was rewarded by a beautiful rainbow (a double rainbow in fact!). I felt good. I felt happy. I was finally going to finish the trip I never finished those years ago. Anyway after I recovered myself I headed on towards Mae Chaem, happy that I the past was now behind me. Before I got to Mae Chaem the sky was getting dark. I had set off way too late in the afternoon and with the rainstorm stops (2 stops) and the time resting near my accident point, I found myself beginning to ride in the dark (and around these areas it really is PITCH black at night). The headlight on my dtracker is poor and the GPS on my phone was out (because i had no signal), so as I wasn't sure how much further it was to get to Mae Chaem, I decided to rest up at the first town I came across. Found a small town and some ratty accommodation owned by a sweet old couple and rested up for the night, after eating at a local cheap eatery. In the morning, when I headed out for Mae Chaem, it turned out to be just about 15 mins away haha. But no regrets, I enjoyed the quiet cheap place. There was also one very lovely aspect and that was the brightness of the stars outside. There were very few streetlights and no road lights anywhere around the area, so the sky was stunning. It was a little spooky at times though...BOO!. I actually (embarrassingly) don't quite recall what i did after that. I think I was just on a high. A high from the trip and from it being such a significant trip for me. I do remember arriving home a bit later and thinking "I wish I was still out riding! ".